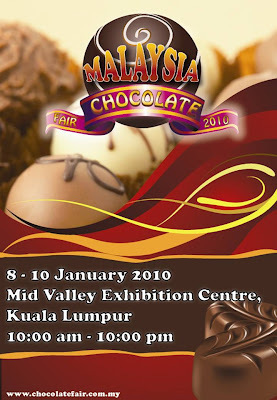 You are invited to visit Malaysia’s 1st Chocolate Fair 2010. Schedule from the 8 – 10 January 2010 at the Mid Valley Exhibition Centre, the fair is open from 11.00am to 9.00pm daily. Lots and lots of chocolates to be won! Delicious sampling of both local and imported chocolates. You will find chocolate from Russia, Switzerland, Australia, Germany, Austria, Iran, Belgium, US and of course, Malaysia. Activities include chocolate making demonstrations by renowned French chef, quizzes, chocolate appreciation open to ALL VISITORS. VISIT www.chocolatefair.com.my Admission is FREE. looking forward to be there this weekend, will u be there? if got coca cola from jap, uk etc to testin drink.. i wan go..
chocolate.. urm i dun eat chocolate.. x suka chocolate. lynn: no problem.. thanks to the ppl who keep fwd-ing me emails of stuffs like this.. n make my wallet lubang besar.. haha..
ok la.. i admit.. i won't buy chocolate... well maybe i will... see lah so many ppl like chocolate..